I’ve been thinking about how often we deem our homes (and our lives in general) not grand enough, clean enough or beautiful enough to enjoy. Our entire generation is notorious for always looking toward the future for that elusive moment when we can finally start enjoying life. I'm sure you too have once or twice found yourself thinking, "If only we had a bigger dining room, then we could host dinner parties" or "If only our house could stay clean for longer than a few minutes, then we'd definitely invite friends over more often" or "If only we didn't live in a rental, then we would transform our bedroom into a dreamy master retreat." The excuses are endless and, quite frankly, nothing short of ridiculous. Take the master bedroom, for example. Considering the extensive amount of time we spend in the bedroom, we may as well make the space appealing. Sadly, it is quite possibly one of the most ignored rooms of the house, mainly because it's not one that guests typically see. Ideally, the master bedroom ought to be your private oasis – a space for relaxing and restoring body, mind and soul from the daily stresses of everyday life. 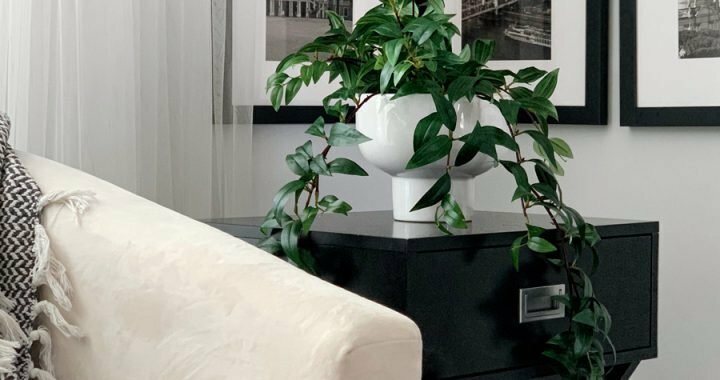 To encourage you to enjoy whatever living situation you find yourself in, I'm sharing five ideas to inspire you to transform your space into a relaxing oasis. Choose a calm palette. A soft color scheme is often used to set an understated and refined tone. 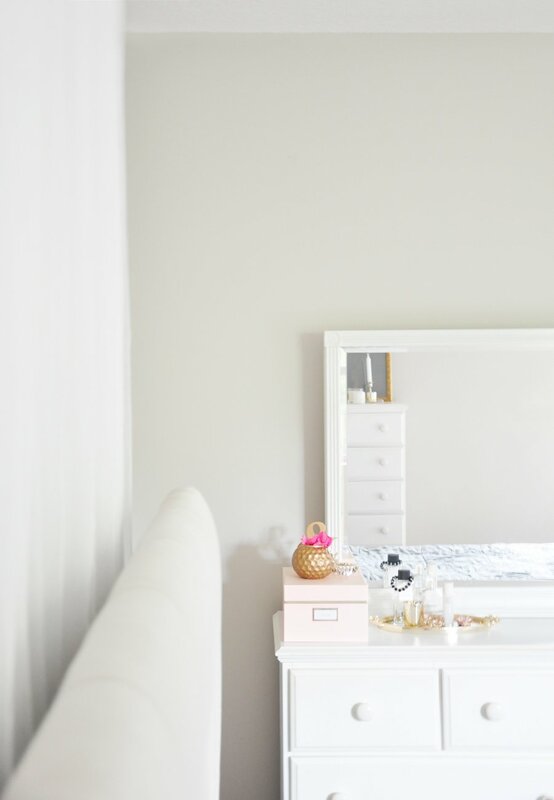 To recreate this look in your own bedroom, opt for a neutral palette ­– off-white, ivory, dove grey or soft blush are all great options. Live in a rental and can’t paint the walls? 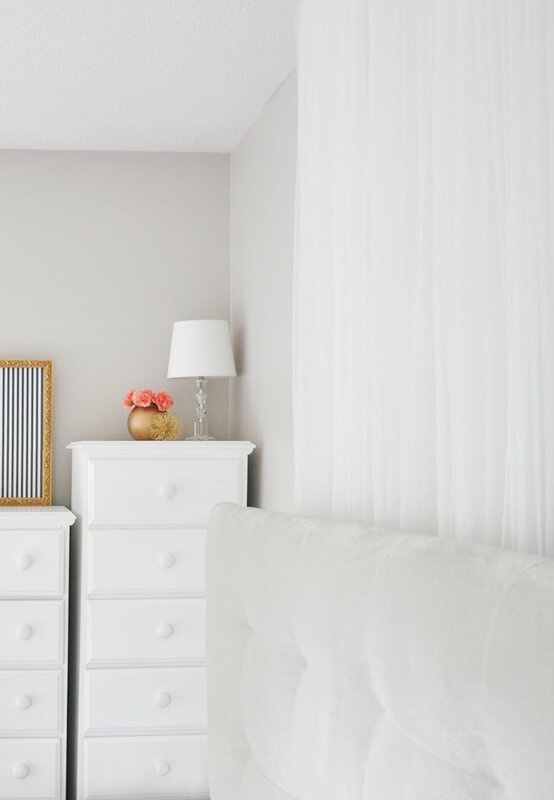 Luckily, most rental homes and apartments have white or soft grey walls, which works great for the master bedroom. Keep the space from looking too sterile by layering slightly different shades of the same color. Indulge in a dreamy bed. Sinking into soft sheets, fluffy pillows and a cloud-like comforter at the end of a long and stressful day is quite possibly one of life's most simple and underrated pleasures. Start with a good mattress, preferably a queen or king size. 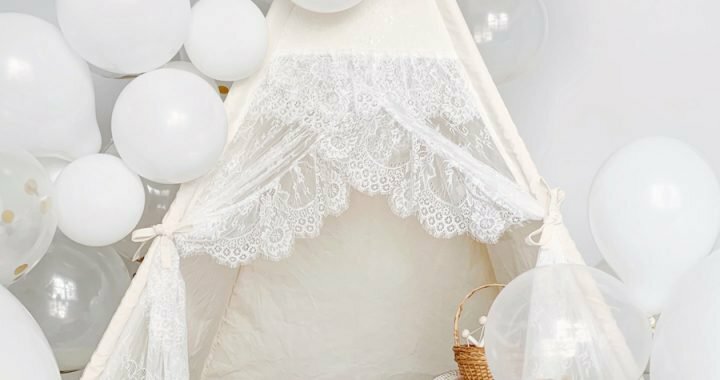 More importantly than the size, however, is that you invest in soft and breathable bedding set – none of that synthetic nonsense. 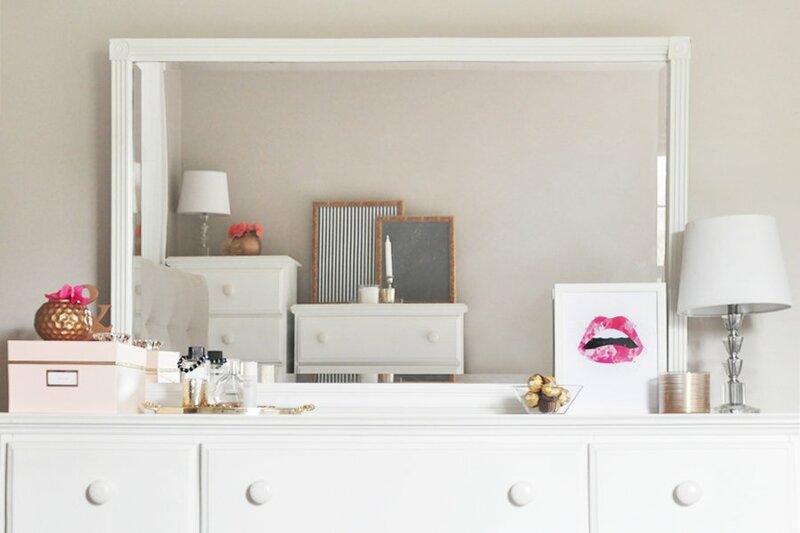 Eliminate clutter with ample storage. 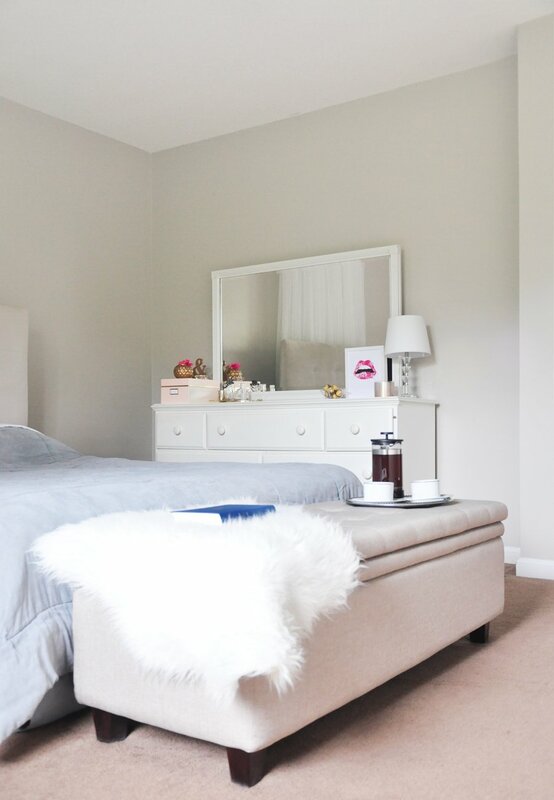 Clearing the bedroom from clutter not only gives the space a streamlined and calming appearance, but it also makes the bedroom appear larger than it really is. 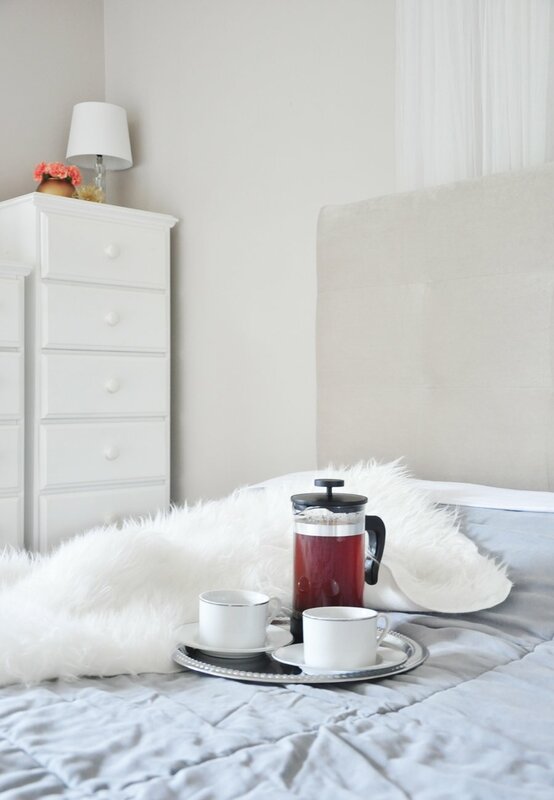 Clear the area around your bed of anything that doesn't serve the purpose of delighting or relaxing you. Storage benches, like this Alcott Hill option from Wayfair, are great for quickly stowing away unnecessary objects, ensuring a clutter-free, relaxing space. Set the mood and relax your senses. 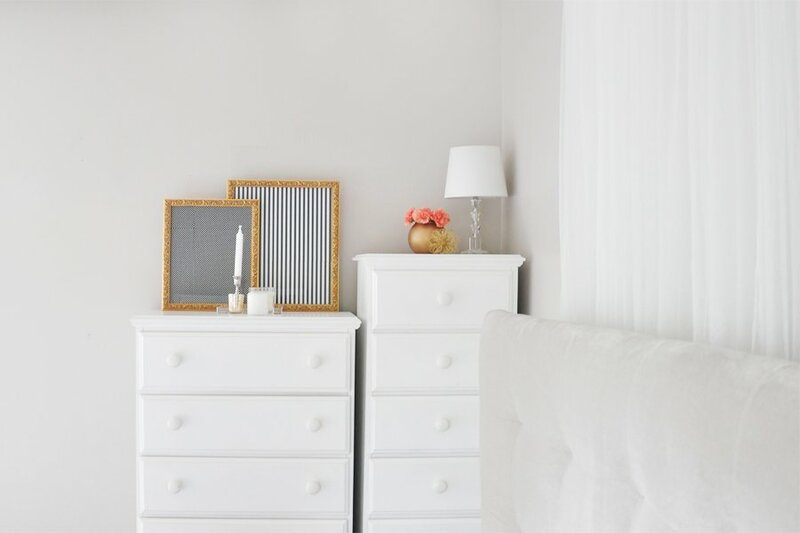 Utilize your dresser or nightstand to display only items that help you relax. Consider adding a lamp that sets a romantic mood, an arrangement of candles or possibly a vintage record player to add to the overall relaxing mood. 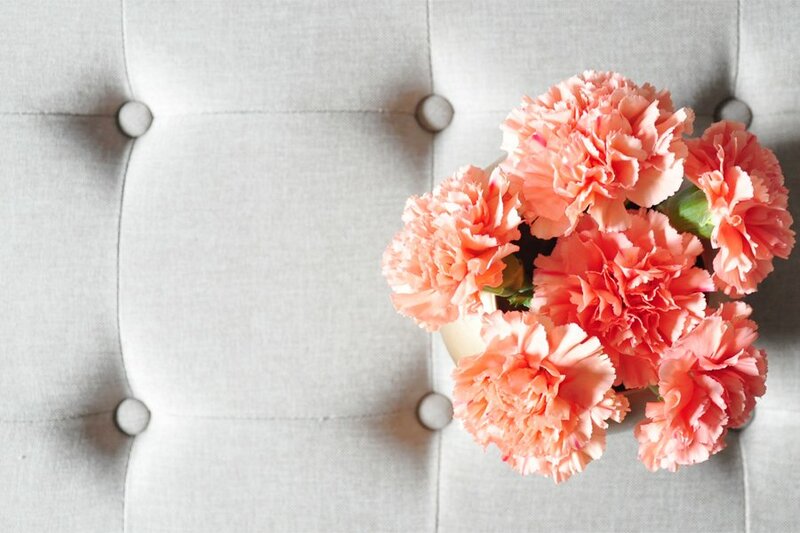 A bouquet of flowers is also a nice way to enliven the space, even if it consists of a few simple stems. Layer on textures for a cozy, plush feel. 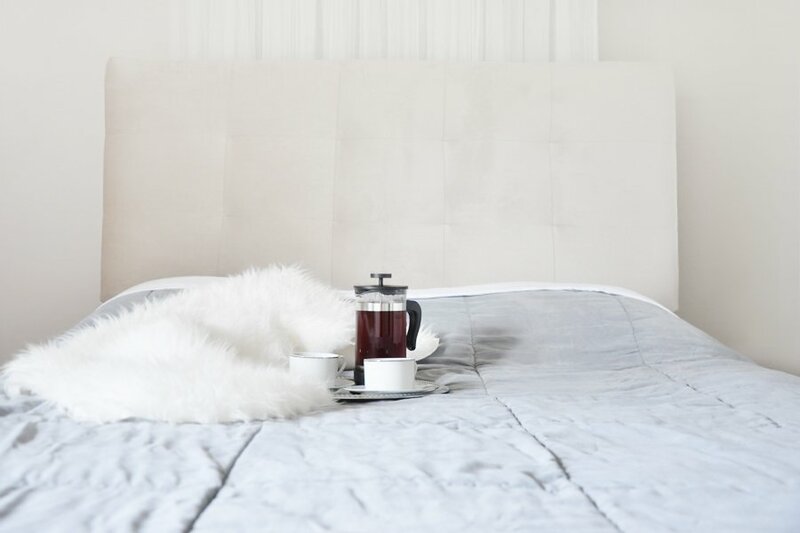 A velvet headboard, a canopy wall, a tufted ottoman and a faux fur throw go a long way in adding dimension and transforming your bedroom into a comfortable, cozy and relaxing space. Even if your wall color isn’t idea, you can add so much versatility to your space with a few textured pieces. Tell me: What are some excuses you give yourself for not enjoying your current living situation as it is? What are some quick, budget-friendly ways you can transform your own bedroom into a luxurious and relaxing master retreat? Big thank you to Wayfair for gifting us the Alcott Hill Upholstered Headboard and the Alcott Hill Storage Bench to test and review. Posted in HOME DECOR and tagged INTERIOR STYLING, MASTER BEDROOM. I love this room! You make a very good point that our generation has a habit of pushing our desires onto to-do lists for the future, but why not improve our daily lives now?! You’re so right! I’m guilty of always looking to the future, and I love to host parties, so I can definitely relate to your statement. My place isn’t huge, but I’m still having a party this weekend to celebrate Mardi Gras. I love how chic and clean this looks. I always loved the look of white furniture, and I love your pops of color. Hi Tiffany! Thanks so much for stopping by and sharing your thoughts! Kudos to you for not letting the size of your home discourage you from inviting friends over! I can’t believe it’s already almost the weekend – where did this week go?! First of all, you have a BEAUTIFUL bedroom!! My most used excuse is, “well I still need to purchase blank and blank, and then I’ll be done” .. which is silly because decorating is a constant process and it will never really be “done”, so start enjoying now!! But because I’m a lifestyle blogger, are there any other home decor topics you’d like to see covered on the blog in the future? Any design dilemmas you’d like some advice on? I always love all white bedrooms. I find them so peaceful! I couldn’t agree more! For whatever reason, many people are scared of decorating with all-white, but I’m like you – I find the palette calming and oh-so-versatile! 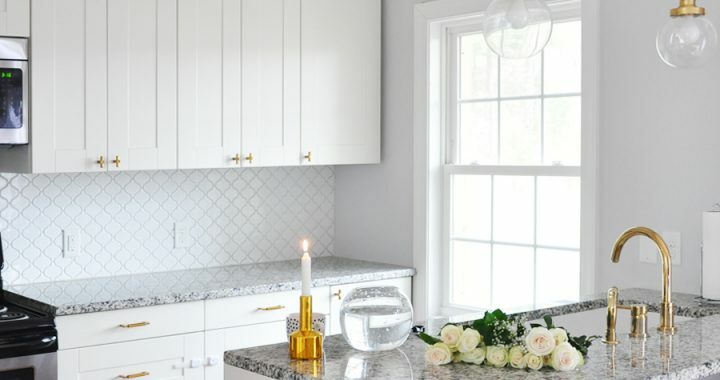 Are there any other home decor topics you’d like to see covered on the blog in the future? Any design dilemmas you’d like some advice on? Gorgeous! This is definitely giving me some inspo for our bedroom!! Thanks so much, Ashley! Are there any other home decor topics you’d like to see covered on the blog in the future? Any design dilemmas you’d like some advice on? Having a calm palette is such a must when creating a relaxing and welcoming space! Couldn’t agree more! As a graphic designer, I’m always uber aware of the effect a certain color palette has on our moods and our minds, in general. Thanks so much, Larissa! The space is definitely nowhere near where I’d like it to be, but as I said, it’s a temporary solution. I’m definitely looking forward to finishing the house and having a proper “his & hers” master bedroom, with more sophisticated touches! Any progress on your own decorating? I love all the white. It’s so crisp and clean. The colors you choose make such a big difference. I really like learning about color psychology. Hi Elana! So happy to find a fellow blogger who loves color psychology as much as I do! As a graphic designer, I’m always uber aware of the effect a certain color palette can have on our moods and minds in general. Are you also into personality psychology, by any chance? If so, I’d love to hear your thoughts on this article about personality tests. I absolutely love how your bedroom looks. I am dying for a beautiful headboard like the one you have. Thanks so much, Jenny! I had been searching high and low for a tufted headboard, and this one is oh-so-soft, with its velvet fabric and dove grey palette. 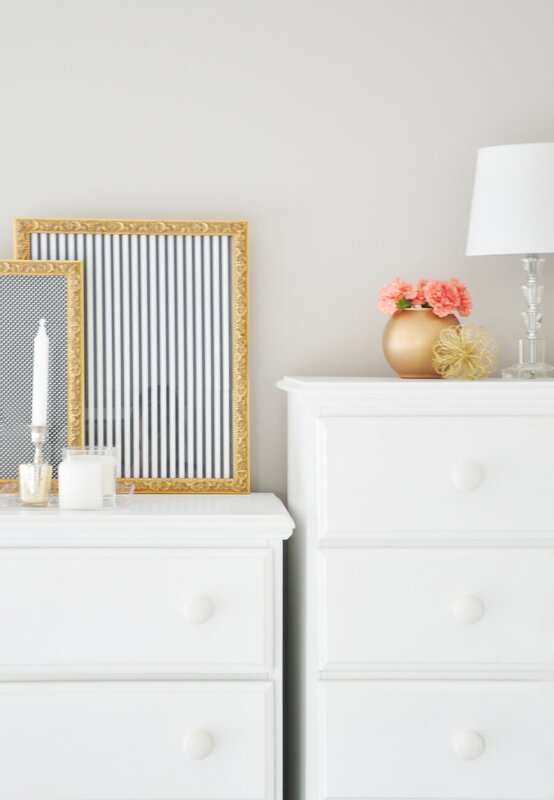 Check out Wayfair.com – they’re always having daily sales, and you can score a stunner for less than $150! i am redoing my bedroom right now and I absolutley agree with everything you mentioned. I also am in love with all the room inspiration you have added. 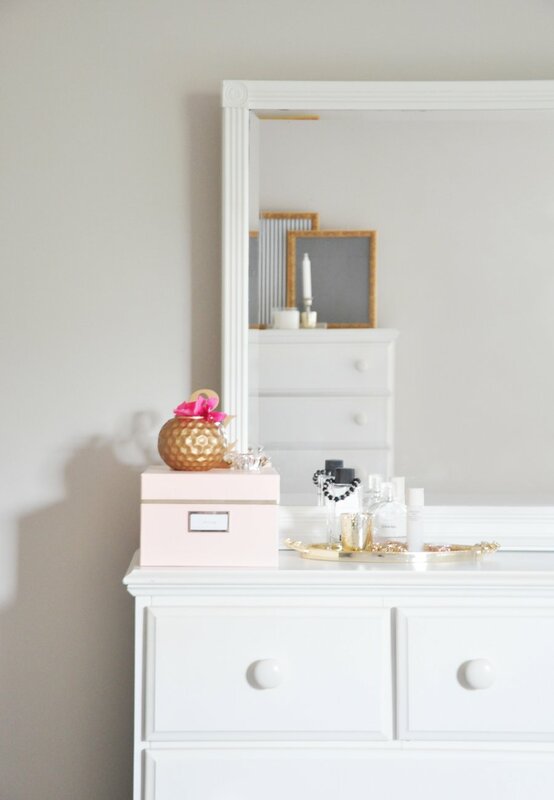 I love an all white bedroom with blush or light gold accents. Hi Claudia, thanks so much for stopping by and sharing your thoughts! Would love to see how you decorate your bedroom! 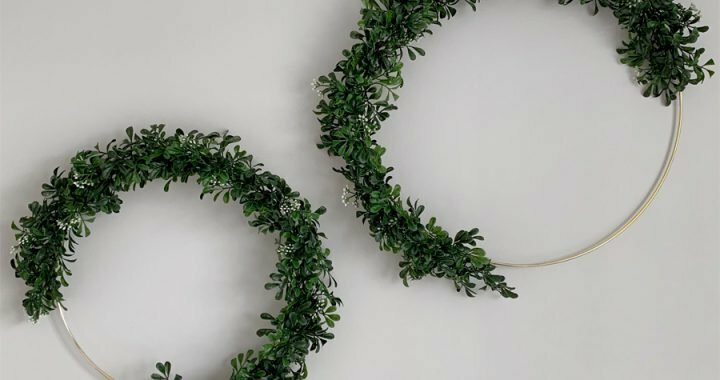 Are there any other home decor topics you’d like to see covered on the blog in the future? Any design dilemmas you’d like some advice on? I definitely agree in indulging in a relaxing comfy bed! It can be such a bummer when you can’t paint the walls, I always just invest in fun prints! Love your set up! Thank you so much, Kayleigh! 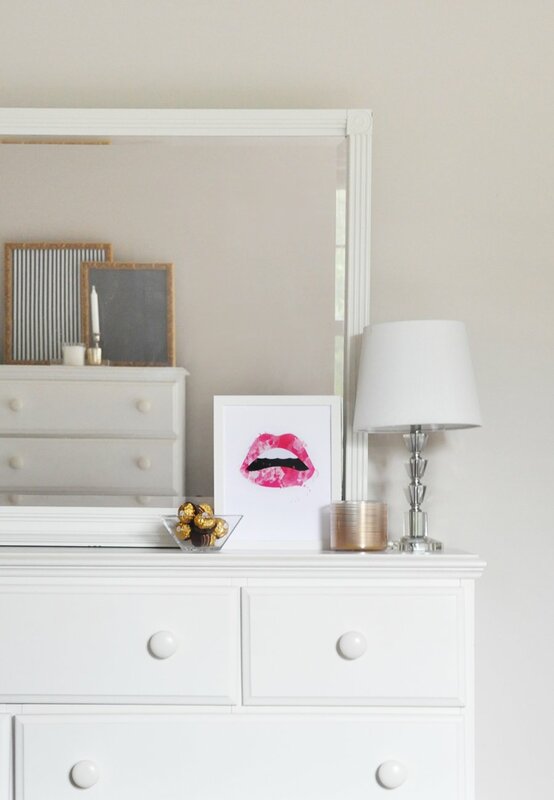 Prints are always a great way to update any space! If you’re ever looking for new ones, feel free to pop over to the FOXY OXIE Shop! So true! 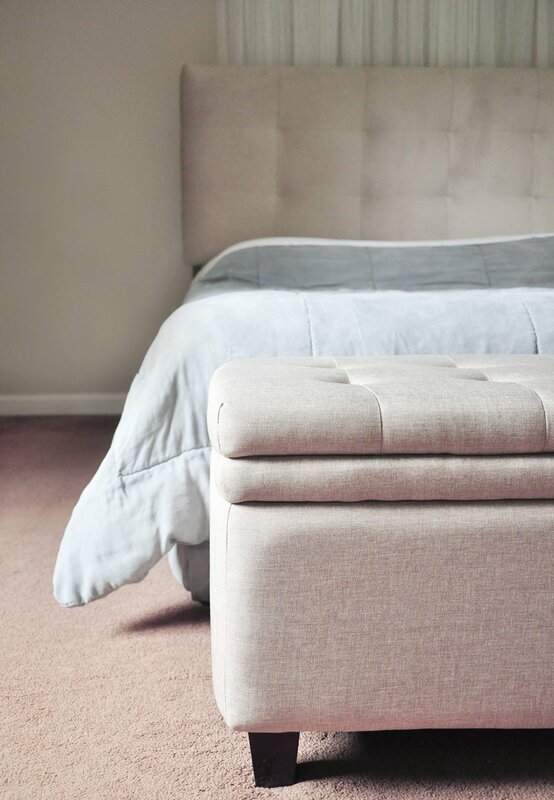 Dreamy beds and cool/neutral colors are everything. What a gorgeous room you have! WOW! Your bedroom is definitely a retreat. I feel relaxed just looking at it! I love the soft colors and the minimalistic design. I like the idea of relaxing your senses. I definitely need to fix up my room a little. It’s a little too packed! Thanks so much, Lauren! The bedroom is rather simple and definitely nowhere near what I want it to be, but it is temporary, after all. I just got incredibly tired of always saying, “Why spend money on this room, when we’re moving out within the next six months anyway?” So I decided to improve the space as much as I could without being wasteful. I cannot wait until we finish remodeling our 1930 bungalow, so I can properly decorate a “his & hers” master bedroom in a more sophisticated style. Are there any home decor topics you’d like to see covered on the blog in the future? Any design dilemmas you’d like some advice on? I love my heated blanket, it definitely keeps me warm in my cold room! I picked pretty neutral colors, gray, navy and white! Since my bedroom is also my workspace, I have some fun pops of color! one of my favorite investments has been this wooden tray from Target that I use to bring coffee, breakfast and a book to bed with me in the morning! Awesome post! Hi Ashely, thanks so much for stopping by and sharing your thoughts!!! Do you not find it distracting to have your workspace in the bedroom? For me, it was a bit of a challenge, because I have the tendency to keep working until I fall over with exhaustion. When the husband and I moved into our current town home, it came with a second bedroom, so I was finally able to have a proper, separate office space. Truth be told, I still end up bringing the laptop into bed every once in a while, but having that separate space is definitely helping me balance my work and home life a little better. I’m a college student sharing a 2 bedroom apartment, so I didn’t have a choice! But with my back to the bed, it’s so much easier! Hopefully when my fiance and I move in together I will get a separate space!